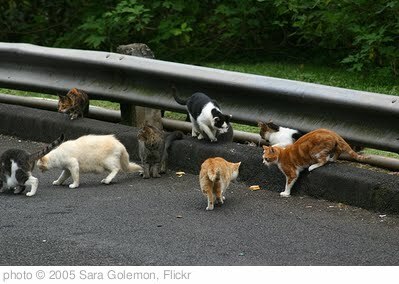 TNR is an important part of helping control the feral cat population. Did you know what it stood for? Q: What does TNR stand for? A: TNR stands for Trap-Neuter-Return. Feral cats are trapped so they can neutered. Those that are friendly are adopted. Those who aren’t able to be adopted are returned to the area they came from. Breeding ends as does the fighting and disease spread caused by intact cats. Come back next Monday for another chance to see the next question that can get you an entry into the monthly contest. im greatful for TNR that is done in my neighborhood. I have been doing TNR in Raleigh,NC for 10 years. I have seen a decline in the number of feral cats!! There are colonies I have worked on with TNR that have not had any kittens born into it for over a year!!! TNR works!